Apparently there is a site called Brick Owl that is similar to Bricklink. There's also a minor controversy surrounding the new owners of Bricklink. The New Elementary says it so much better than me so I'll let him explain. And then there's this site called Bricksy. There's also a new site based around trading minifigs. 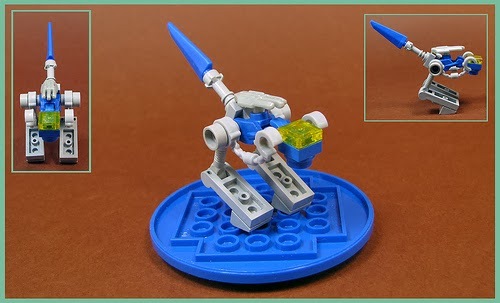 I know we're not big into minifigs as a community, but this could help you get rid of some that are taking up space for others that may have usable parts you need. For those of you in the United States, or have access to shipping from the United States, there are some great deals going on right now for Lego in the days leading up to Black Friday. I really should have brought this up last week but I've been too busy bargain hunting. The two that come to mind are a couple of one day sales. The 70707 Galaxy Squad Eradicator Mech for $22, and 31004 Fierce Flyer or 31002 Super Racer for $8. I'm going to point you at the Toys'N'Bricks forum and tell you to join. They have a sub-forum just for chasing deals! Right now the Black Friday sales don't look like much. There are a few things here and there but the majority look kind of average. The sales right now are better. So get out there and start bargain hunting! As I posted in the first half, these are the remaining packages I need to review. This is the Off-Roadster set with 31 pieces. Here you can see the minifig, instructions, and package. On the right you can see the back of the package that shows all of the sets that are available. As before, we have a serial numbered piece. There are a couple of Clip Plates and a Bar Plate (open ends). The 1x1 Round Plates w/Bar beg to be used in something. This set comes out to $0.10 per piece. This is the Hovercraft set with 33 pieces. I think the piece that intrigues me the most is the two part steering wheel. And can someone explain why a hovercraft needs wheels? This set comes to $0.09 per piece. Here we have the Space Drone set with 40 pieces. I see a Clip Tile! Score: 0 (B) / -5 (B-) . The Hovercraft and Space Drone are "B"s. The Off-Roadster is "B-". These would be good for building up a library of pieces. 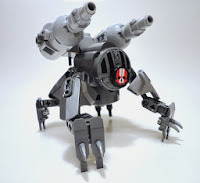 Here's a review of the Kraang Laser Turret polybag from the TMNT line. The bag and instructions. These are available for $3.99 at Toys'R'Us. The minifig. That head could make a good head for a frame. The light blue color of the body is also interesting if you can find a way to use it. The Parts. Straight out I see an octagonal Bar Plate and four Robot Arms. There's also a Lampholder and, one of my favorite pieces to work with, a Black Technic, Liftarm 1 x 2 with Bar. You also have enough pieces to make four "people" in 6P scale. Score: +5 (B+). It's a decent set that could provide you with a small frame and some "people". With either a few more pieces or a lower price point it could be really competitive. Yeah, yeah, I know, cheap pop. As I mentioned before we're doing work on the house and moving things around. One of the things we're doing to make room is getting rid of things we don't want, need, or have room for. This has led to a lot of trips to Savers. The last time we went I decided to go in and have a look around. I ended up stumbling across a bag of old Bionicle parts. Turns out it had 100 pieces for only $1.99. That's a fair amount of axles I didn't really need. On the right side are smaller feet pieces that Soren and Wordman have been using to great effect. Across the bottom row are three shield like pieces. In the middle left are four pieces that could be used as a body for a frame. And those claw-like pieces in the middle right column are pretty neat too. More of those smaller feet, and the "body" pieces. And, hey, rubber bands. In the bottom row are more pieces that could be the body for a frame. In the right-hand column are three shovel like pieces that could act as armor or shields. The two pieces on the left in the middle could act as HtH weapons. All in all, it was a pretty good haul for the price. So the next time your near a thrift shop -- Goodwill, Savers, etc. -- take a peek inside. You might find a great deal. 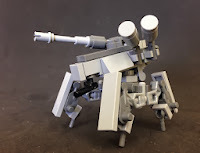 For a while I've wanted to do a review of Brickarms and Brickforge parts. I've got a fair amount of them stashed away in small tackleboxes. I think I even use a few of them in builds. I saw this review of the Brick Warriors Warrior Pack though and decided to go looking for them and do my own review. Here's the package. I picked them up for $2.99 at Five Below. Each package comes with a code for 6 free items as part of an online order. One thing I didn't take a picture of is that these all have a transparent section on the back so that you can see what you are purchasing. Here are the parts from the first set I purchased. The parts from the second set. As you can see, they're a little small for 7P scale. They almost look like toys in the Chub's hands. The shield is more like a buckler when held by the Chub. The sword is closer to a combat knife in size at this scale. It looks good though. They look a bit better when wielded by the Classic. The sword actually looks like it's sword sized at this scale. Score: -15 (C). Harsh, but true. The most these packs are going to provide is a few accent pieces for your frames. Once more I bring you some non-human mechs that have caught my eye. Ma.K3loid by legosamurai. I'm not sure about the tiny feet, but this guy has lots of personality. Strahl HAFS HK-59 MOGMA by nate_decastro. This one is a beast. It may be too big for most MFZ games though. 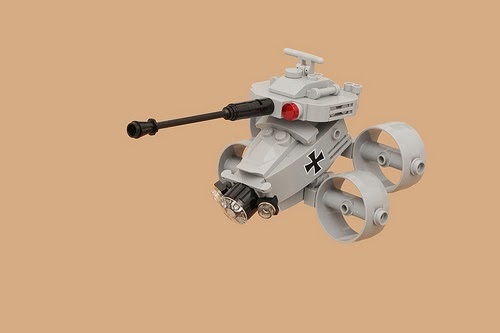 Brummkreisel by Pasukaru76. Yeah, what can you say except simply fantastic. 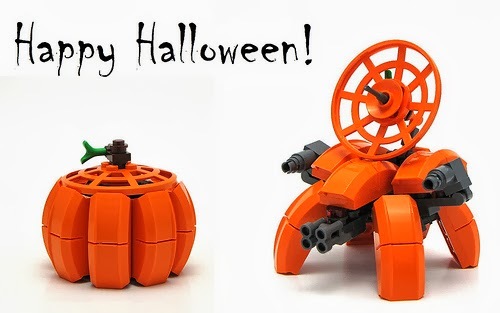 Pumpkinbot by cmaddison. A transforming vegetable. Robots in disguise indeed! It also has instructions. Blyde MK.II by Karf Oohlu. A cute little guy with neat parts usage. Anyone who knows me knows that I'm a packrat. I keep things well beyond the "stay fresh" date. We've been moving things around in the house lately as we're going to have some work done and this led me to consider a few of the frames I've kept assembled. I've mentioned before that I keep all of my creations assembled even if I'm not going to use them in a game at any time soon. There are a few that I've considered reducing to their component parts and putting the parts back into storage. Oddly enough, the ones I'm considering are from past Frame Chef challenges. I've proven to myself I can use the signature part, I need the other pieces for other builds, and I need a little less clutter right now. It just feels odd to be so readily willing to disassemble something I've built. Then again, both of the builds are kind of ugly and not really some of my better work. It does make me wonder how long, if at all, other people keep their creations assembled. I know there are people out there with small Lego collections that build, take pictures, and then disassemble frames on a regular basis. In case anyone is wondering this and this are the frames that are slated to be disassembled. Here's a review requested by someone on the MFZ Facebook Fan page. Here's the bag and instructions. I picked it up for $3.99 at Target. Here are the parts. As you can see there are an awful lot of plates of different varieties. Score: 0 (B). I think the score doesn't really reflect the lack of cool parts in this set. If you have need of these parts in blue and black then, by all means, purchase this set. With the release of the playtest spaceship combat rules for MFZ I figured I'd give people a peek at a set of ships I designed to be used as a faction fleet. This is a Battle Cruiser. For the moment, you can call the spinal mount a double Laser (2Rl+d8), and the antennas on the top can be Sensors (1Y). The spring launcher on the side can be a Frame Catapult. This is a Strike Destroyer. The spinal mount can be a Laser (2Rl), the brackets on the sides can be Missile Launchers (2Rm+d8). The tiles in front of the bridge can be Armor (1B). This is a Death's Head Destroyer. The turret can be Ack-Ack (2Ra). The skull piece can be a Missile Launcher (2Rm). The slab sides can be double Armor (2B). This flotilla currently has the Battle Cruiser in the center flanked by two Death's Head Destroyers. The Strike Destroyers running intercept in front and back. With five ships and 20 attachments it will probably be the Primary Attacker. One of the things Joshua said he would do during the Kickstarter is work on a set of rules for spaceship combat for MFZ. Here is the new playtest document that Joshua has written. I can't wait to try them. As seen here, I came up with a frame design based around the die from the Lego games line. I've built a couple more in the meantime. A slight bit asymmetric. Brickshelf gallery. This one's a little bit weirder. Brickshelf gallery. Hopefully I have a few more ideas involving this design up my sleeve. Over on the Hangar, Dukayn has posted a number of PDF instructions that he has created through LDraw. Other people have joined in. I've also added a permanent page for frame build instructions.